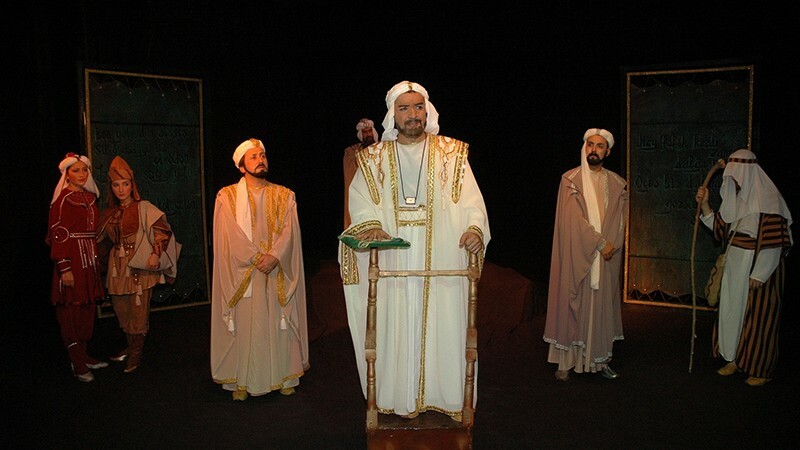 Sheikh Sanan in Azerbaijan State Youth Theatre of Young Spectators buy tickets online. Delivery of tickets for the event Sheikh Sanan. People are faced with the fight of morality in this play, written by the prominent playwriter, in fact, with the idea of ​​great tolerance. The Great Javid wrote a wonderful play, adding divine love and its eternity tohis feelings about peace​​. Every spectator watching the performance based on the tragedy play tries to clarify its own point of view: Do I stand in a right place in this world that I live? How much have I done for humans? Sheikh Sanan, who sacrifices his dears and religion, even agrees to clean the swine stalls, and hang a cross round his neck. However, secular and religious discriminators make obstacles for him tomarry Khumar. That's why these sweethearts see suicide as the only way to escape. In this play, which is distinguished by its secularism and didactics, the events between representatives of the two nations, the two religions arouse feelings of regret in spectators. It also encourages them to have a deep sense of self-esteem, towards our people living in a democratic society in the modern world.The performance has dresses in classic style, impressive decoration, as well as beautiful musical drama.